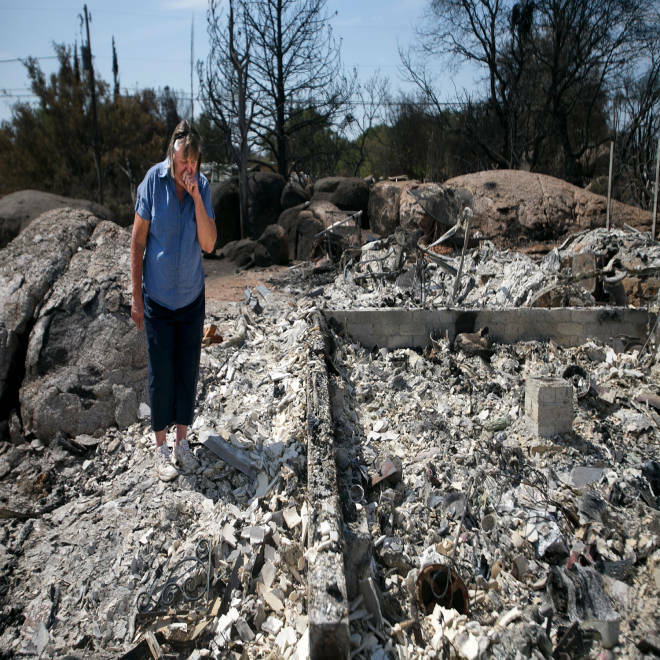 Judy Aldridge looks over the remains of her home in Glen Ilah, Ariz., on July 10 after the Yarnell Hill Fire. The federal government Friday rejected Arizona’s bid for a major disaster declaration for the deadly blaze near Yarnell, which killed 19 firefighters. Brewer said she was “deeply troubled” by the “misguided decision” to deny supplemental federal aid to Yavapai County, which was ravaged by the fire in late June and early July. Brewer requested the disaster designation from FEMA on July 9 to provide funds to residents forced out of their homes by the lethal blaze. She pressed Obama on her request Tuesday when he was in Phoenix to deliver an address on housing, according to The Associated Press. But in a letter to Brewer obtained by NBC News, FEMA administrator W. Craig Fugate said state, local and volunteer groups were more than up to the task of helping uninsured homeowners replace and rebuild their charred residences. The agency, following a thorough review, concluded that the fire “was not of such severity and magnitude as to be beyond the capabilities of the state, affected local governments, and voluntary agencies,” Fugate wrote. FEMA takes into account a range of factors, including insurance coverage, in reviewing bids for federal aid, said spokesman Dan Watson. Brewer now has 30 days to appeal the denial, according to Fugate’s letter. She said the state will "review its options regarding an appeal." The federal government in late June granted Arizona money in support of “efforts to protect lives and property during the fire fight and to mitigate the volatile wildfire conditions,” Watson said. More than 100 homes were destroyed and another 23 damaged in the Yarnell Hill Fire, which was sparked on June 28 and claimed the lives of 19 elite Hotshot firefighters. Republican Sens. John McCain and Jeff Flake released a joint statement to convey their disappointment with FEMA's decision, according to the AP. "The people of Yarnell waited a full month to receive word that federal assistance is not coming. It is a shame that FEMA couldn't find it within their mission to help rebuild their homes and lives," McCain and Flake said. "We will discuss this matter with the governor and begin exploring with her options for appealing this decision." Watson said more federal resources are available to Arizona, such as loans through the Small Business Administration and the Agriculture Department and Housing and Urban Development.